“Welcome to the Tech Studio!” I exclaim to a group of elementary school students and their chaperones as they enter through the glass-walled threshold. They pause a moment to survey the room. Dozens of eyes scan the colorful objects on the shelves and table as the children roam the area. Miniature monuments sit next to a DNA helix, human and animal skull replicas reside next to tiny toy elephants, sheets of chainmail are scattered across the table, and even a bust of Ben Franklin can be found next to a giant rainbow pangolin. It’s hard to decide what to look at first. I interrupt their indecision, gesture to the whirring, box-like machines in the room, and say, “All the objects you see on the table and shelves were 3D-printed right here on our 3D printers.” A few heads turn to me in disbelief, and one of the girls speaks up. Several other children softly agree with her question and look to me expectantly for an answer. I smile at their eager faces. Hi. My name is Max Santangelo and I am the Tech Studio Coordinator here at the Franklin Institute. My job is to oversee the Tech Studio, our 3D printing exhibit area. I mostly work behind the scenes creating relevant educational content for the space, maintaining the 3D printers, and developing future programming about 3D printing, CAD (computer-aided design) and other technologies, but you can also find me out on the floor of the museum working directly with visitors. I’ll mostly likely be in the Tech Studio answering 3D printing questions, running activities around the building, or leading an engineering and design workshop. 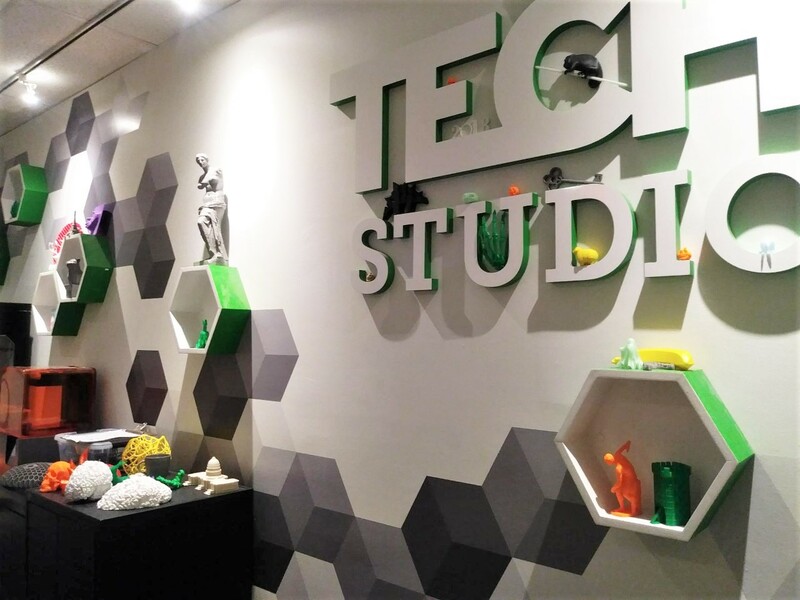 If you’ve never been to the Tech Studio, here is what you can expect. We have 3D printers operating every day that you can see up close. 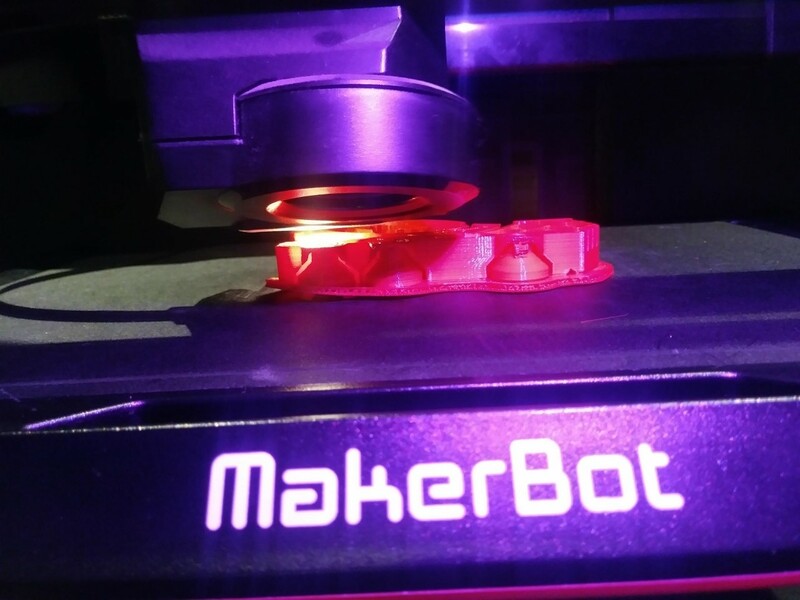 You will be greeted by a facilitator who can tell you all about the 3D printing process as well as provide examples of real-world applications of the technology. Feel free to pick up all the objects on the shelves and table—this is a very touch-friendly area! Our goals in the Tech Studio are to expose visitors to 3D printing as an engineering tool and open their minds to the technology’s innumerable potential applications. After all, if you can imagine it and design it, you can 3D print it. I hope this article inspires you to check out the Tech Studio during your next visit to the Franklin Institute. Make sure to keep an eye on the Institute’s website for upcoming 3D printing workshops as well as any future Tech Studio updates.